First wave. Third aircraft to attack Eder Dam. Mine dropped accurately causing final breach. Frederick Edwin Sutherland was born in Peace River, Alberta, Canada on 26 February 1923, the only boy in a family of the three children of Dr Frederick Henry Sutherland and his wife, Clara. His father was a doctor and his mother was a nurse. From a young age, he had wanted to fly and had dreams of becoming a bush pilot, but the war put paid to that. So he joined the RCAF in 1941, as soon as he turned 18. After initial training he volunteered for air gunner duties. He arrived in England in 1942, and crewed up with Les Knight and his future colleagues at a training unit before they were all posted to 50 Squadron in September of that year. He flew on 25 operations with Knight before the whole crew volunteered to transfer to the new 617 Squadron in March 1943. Like most of the squadron he had no idea what the target was to be until he walked into the briefing room hours before take off on 16 May 1943. When he saw the scale model of the Möhne Dam, the first thing he noticed were the 20-millimetre gun posts at either end of the dam. ‘I immediately thought we didn’t have a hope,’ he said recently. We were all afraid of the hill. We had to drop the bomb at the right distance and the right height, and then to make it [Les] had to push the throttles right through the gate, which is not supposed to be done… I didn’t see anything when the bomb went off because I was in the nose, but I heard the rear gunner saying ‘it’s gone, it’s gone’. Hours later, Sutherland was himself on Dutch soil, having parachuted to safety after being ordered by Knight to bale out. After being hidden by a friendly Dutch farmer, he was put in touch with the underground network, and met up with Sydney Hobday. The two were smuggled all the way through Belgium and France to Spain. At one point while on a train, using forged documents provided to him by the underground, he duped a German officer who inspected his fake passport. Suspicious, the officer held the passport up to the light and scrutinized it painstakingly, trying to determine if it was forged. ‘I had to ball up my fists to keep him from seeing how much my hands were shaking,’ he recalled. After getting back to the UK he was sent home to Canada in 1944. Greeted in Edmonton by his girlfriend, Margaret Baker, he proposed immediately. Terry Taerum’s mother found out that he had been posted back to Canada, and asked to meet him. She wanted to know whether her son had any chance of escaping the blaze when his aircraft was hit. ‘Telling her about it was the hardest thing I ever had to do,’ he said recently. 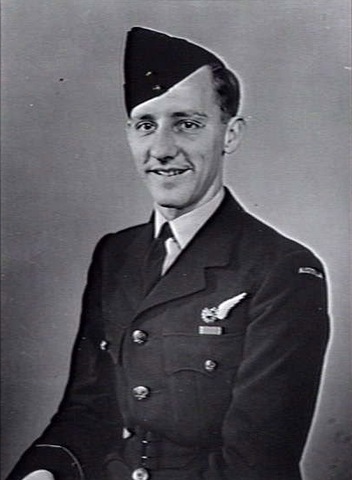 Following the war, Sutherland stayed on in the RCAF for 12 more years, and was commissioned. He then studied forestry, and got a job with the forestry service. In 1964 he became forestry superintendent in Rocky Mountain House in his home province of Alberta, and he still lives in the area. 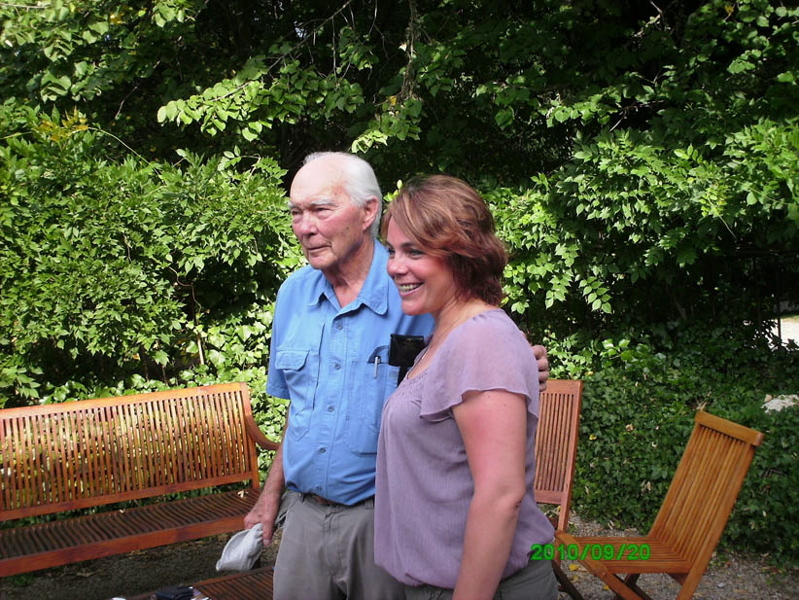 Fred Sutherland used the famous Chemin de la Liberté route in his escape through the Pyrenees, and in 2010, he paid a return visit to the area and met the people who keep the memories of the route alive. 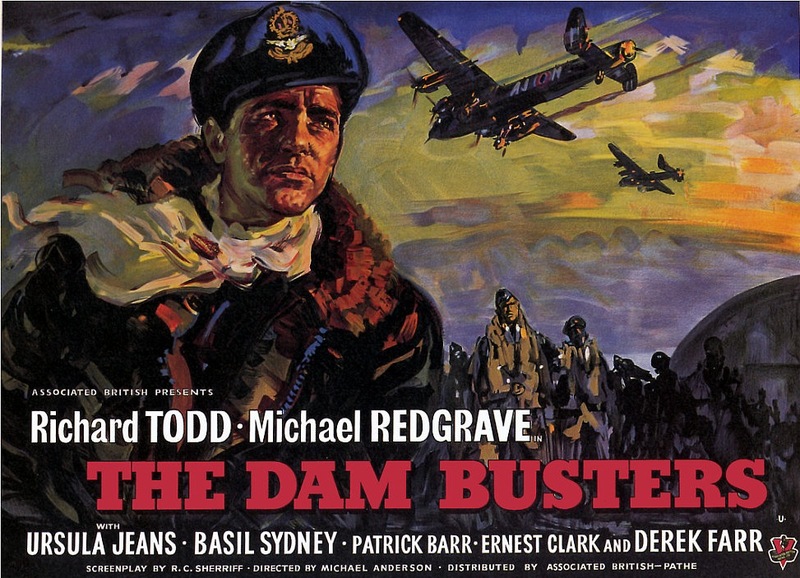 Further information about Fred Sutherland and the other 132 men who flew on the Dams Raid can be found in my book The Complete Dambusters, published by History Press in 2018. 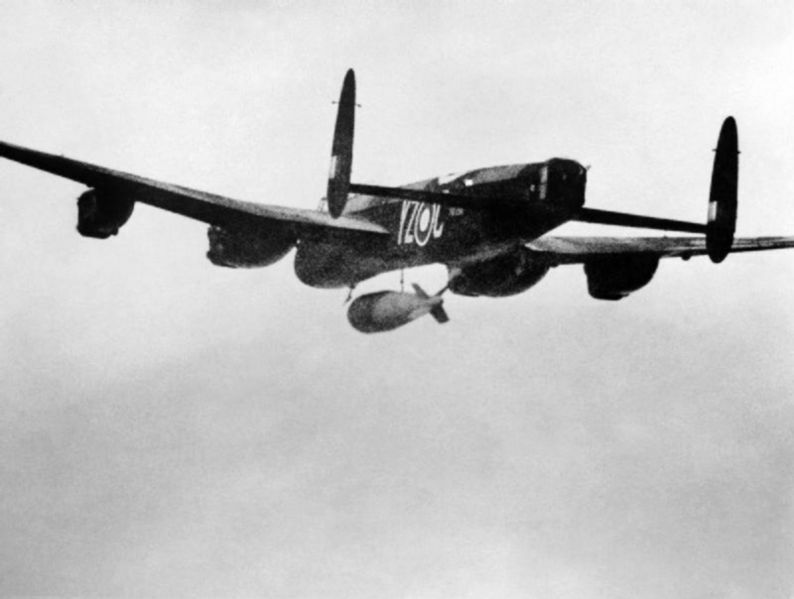 617 Squadron’s reputation as the RAF’s crack bomber squadron was cemented towards the end of the war when it was chosen to drop the first ‘Grand Slam’ bomb. This was the biggest conventional bomb used during the war, and weighed in at 22,000 lbs. It had been designed by Barnes Wallis to create an ‘earthquake’ effect which would destroy buildings or structures in the area without necessarily hitting them directly. On the morning of 13 March 1945 the Grand Slam was tested at the same New Forest bombing range which had been used in the summer of 1943 to see whether the ‘bouncing bomb’ used on the Dams Raid would be effective when dropped on land. (In fact, it caused a trail of debris to be thrown up which would damage low-flying aircraft, so it was never used.) The Grand Slam test drop, on the other hand, was very successful, leaving a crater 70 feet deep and 130 feet in diameter. That afternoon at Woodhall Spa, two specially adapted 617 Squadron Lancasters were loaded with Grand Slams and a further 18 with the 10,000 lb Tallboys, and set off for the Bielefeld Viaduct, an important railway target which had withstood several earlier attempts to destroy it. The two Grand Slams were in aircraft piloted by 617 Sqn CO Group Capt Johnny Fauquier and flight commander Sqn Ldr Charles (‘Jock’) Calder. However, when they reached the target it was completely enveloped in cloud, so bombing was impossible. The squadron returned to base, although as a precaution, given their huge load, Fauquier and Calder landed at the emergency landing strip at Carnaby with its much longer runway. The next day, Fauquier and Calder’s aircraft were reloaded with Grand Slams, ready for another operation against the same target. Fourteen Lancasters were loaded with Tallboys. When Fauquier’s aircraft developed a mechanical fault before take off he jumped out and ran towards Calder. Calder guessed correctly that his aircraft might be commandeered by his superior officer and ignored the gesticulations from the runway. Calder dropped his Grand Slam at the viaduct at 1628. Witnesses described it as looking something like a telegraph pole as it fell, and that it was considerably bigger than anything that had been seen before. The airborne shockwave was felt 3km away. When combined with the effect of the Tallboys dropped around the same time, the effect was as awesome as Wallis had predicted and five arches on the viaduct were destroyed. The New Forest National Park Authority’s current geophysical survey and historical investigation into Grand Slam is part of a wider project researching and surveying the park’s often unappreciated wartime role. Quite apart from Grand Slam, the New Forest was used as a test site for the first Barnes Wallis bouncing bombs, the development of the ‘Tallboy’ predecessor of Grand Slam, as well as early demonstrations of the Churchill tank. The forest was also home to nine wartime airfields, many of which played a key role in D-Day. 41 more Grand Slams were dropped between 13 March 1945 and the end of the war. If they had been available earlier in the war, by how much would it have been foreshortened? Jock Calder was one of 617 Squadron’s most distinguished pilots in the last few months of the war. He died in 1997. There were two bomb aimers called Johnson on the Dams Raid, something that occasionally causes confusion. A third bomb aimer was called Johnston. In the inevitable way of things in the wartime RAF, both Johnsons were also known to their friends and colleagues as ‘Johnnie’ (EC Johnson’s preferred spelling). The older of the two was Edward Cuthbert Johnson, bomb aimer in Les Knight’s crew, who was born in Lincoln on 3 May 1912, the son of Herbert and Jessie Johnson. His father was killed on the Western Front in 1914, when the family were living in Gainsborough. He was then educated at Lincoln Grammar School. On leaving school, he worked for Woolworths and then the catering firm, Lyons. After marrying May Beckwith in 1936, he moved to Blackpool to work in a boarding house business in Blackpool with her family. Their son, Philip, was born in 1938. He joined the RAF in 1940, qualified as an observer/bomb aimer in early 1942, and was commissioned. 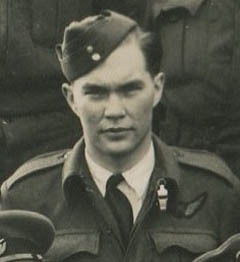 After further training he was posted briefly to 106 Squadron, but then sent back to a training unit to be crewed up with Les Knight and his colleagues. They moved to 50 Squadron in September 1942, and Johnson flew on some twenty-two operations with the Knight crew. Johnson and Hobday were the elder statesmen of the Knight crew, both nine years older than their skipper, and senior to him in rank. But they worked well as a team, each obviously seeing in the younger man the qualities of an outstanding pilot. 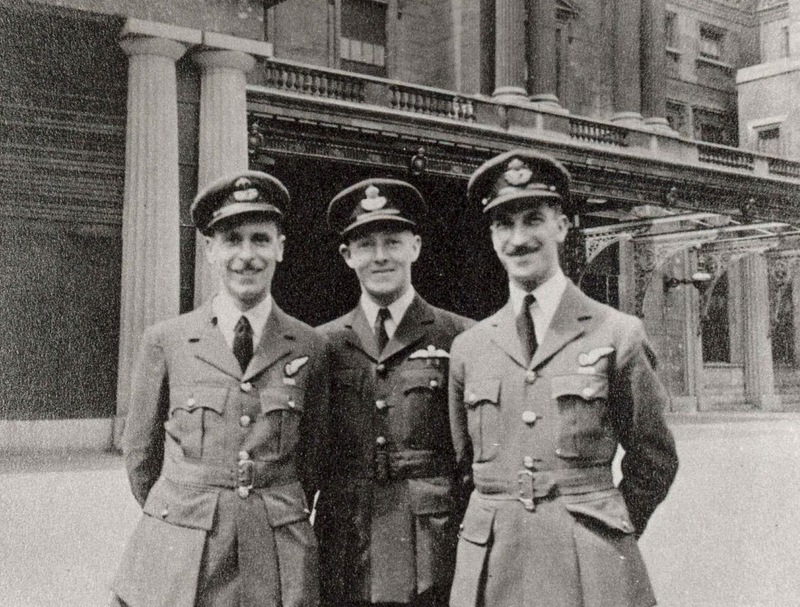 All three were decorated for their role in the Dams Raid, Knight getting the DSO and Johnson and Hobday the DFC, and were photographed together outside Buckingham Palace on the day of the investiture. In September, on the fateful Dortmund Ems operation, Johnson jumped from the stricken Lancaster when ordered to by Knight. He yelled: ‘Cheerio boys. Best of luck. See you in London.’ He recalled later: ‘The farewells were a little hasty but lacked nothing in sincerity for that.’ Like four of his colleagues, Johnson successfully evaded capture and reached the safety of Spain, with the help of a friendly Dutch farmer and policeman, and various members of the resistance in Holland, Belgium and France. He returned to the UK via Gibraltar. He served out the rest of the war in various ground postings, and left the RAF in 1947. He went back to Blackpool, and joined a company selling fireplaces, where he worked until his retirement. Edward Johnson died in Blackpool on 1 October 2002. Survived war. Died 1 October 2002. Robert George Thomas Kellow was born in Newcastle, New South Wales, Australia on 13 December 1916, the son of George and Violet Kellow. He went to Newcastle High School, the same school as fellow Dambuster Jack Leggo, the navigator in Mick Martin’s AJ-P. He worked as a shop assistant after leaving school, but when war came he enlisted in the RAAF. 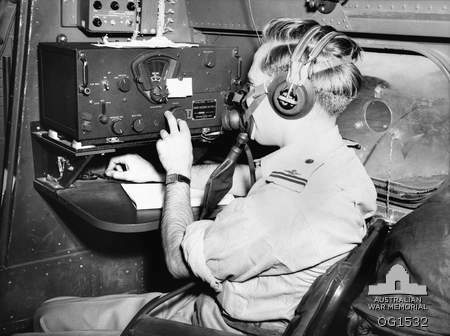 He was selected to train as a wireless operator/air gunner and was sent to Canada for training. From there, he was posted to the United Kingdom, and arrived in January 1942. On the flight to the dams, Kellow was watching from AJ-N’s astrodome when he had the unfortunate experience in witnessing the last moments of Bill Astell and his crew, damaged by flak near Dorsten and crashing in flames a few minutes later. He then had to wait more than an hour while the Möhne Dam was destroyed before they reached the Eder and he was told to start up the spinning mechanism for AJ-N’s mine. Following the successful attack, Kellow was understandably preoccupied while Knight and Grayston pulled AJ-N up and over the surrounding hills, and his message confirming the drop – ‘Goner 710B’ – was sent six minutes after the message ‘Dinghy’, denoting a breach of the Eder, had been transmitted by Bob Hutchison, in Gibson’s aircraft. Knight, Kellow and the rest of the crew were not back in action until September, in the disastrous attack on the Dortmund Ems Canal. Five of the seven crew who baled out of Knight’s aircraft would eventually get back to England, helped by Dutch and French Resistance networks and couriers. Hobday and Sutherland had been reunited and travelled as a pair, but Kellow made the six week journey to Spain on his own a day or so ahead of them, and arrived back in England in December 1943. Like all those who had made the perilous return trip he was not allowed to fly over enemy territory again, to protect the networks he had used to evade capture, so he returned to Australia in May 1944. He served in RAAF 37 Squadron for the remainder of the war, mainly in Australia, but including a deployment to New Guinea where he flew in a Lockheed Lodestar. In April 1946 Kellow returned to Newcastle, NSW, after being discharged from the RAAF, with a glowing report from his Commanding Officer who described him as showing ‘great possibilities for good leadership’, and ‘one of the most liked and well known’ and ‘invaluable’ members of the Squadron. He returned to his job as a shop assistant in Australia, and in 1946 married Doreen Smith, a Canadian who he had met while training there in 1941. By 1952, they had two children and the whole family moved to Winnipeg, Canada, where Kellow worked for the Manitoba Power Commission. He travelled back to the UK for a number of 617 Squadron anniversary events, and paid his respects at Les Knight’s grave in Holland. Bob Kellow died in Winnipeg on 12 February 1988, and is buried in the city’s Brookside Cemetery. If you live in the UK and can receive Channel 5, you may like to know that it is showing The Dam Busters again this afternoon. TV screenings of the film usually lead to a spike of new visitors to this blog, so I’d like to welcome you if you have turned up here for the first time as a result of watching it. If you want to subscribe to the blog, there’s a button further down the page. Or you can get a link to updates by following us on Twitter, @DambustersBlog – if that’s your thing.